Working hard to cut off that stubborn extra fat from your waistline? Ahh, but those crispy treats of fries and chicken wing! Here you start fighting desperately in that eternal “have or not to have” battle inside your mind. No matter whether you win or lose the combat, you end up regretting. Heaving a sigh? Well, you don’t have to. There is a way to indulge in the fried food without inviting the fat to your body. How? Read on to find out. The revolutionary gadget that is formulated to help you enjoy the guilt-free fry days is called the air fryer. The tiny, magical machines use hot air to fry up anything from fries and onion rings to wings and confer it a golden, crispy finish. An air fryer allows you to delve into the deliciousness of your favorite fried treats without the added pinch of guilt to go with it. 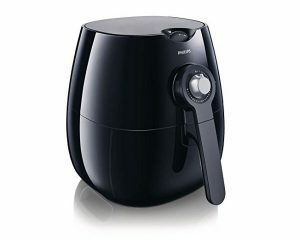 To work their magic, air fryer merges several cooking techniques in one convenient appliance. It features an electric coil that provides radiant heating that goes through the food to warm it internally. Meanwhile, a current of superheated air produced by the fan positioned above the coil flows around the food. This is termed as convection heating that is often found in commercial ovens. The convection process turns the small amount of oil into a fine mist that covers the food as it circulates. Mimicking the traditional deep-frying effects, the food’s own moisture creates the steam as the hot air flows. As a result, you get a crispy, fried nibble. 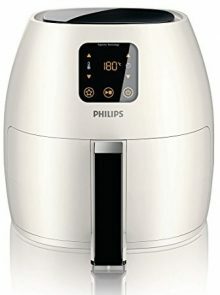 What to look for while buying an air fryer? With a plethora of air fryers swaying in the market, you might be struggling to find one that will give you the results you expect. If you are wondering what to look for while buying an air fryer in 2018, here is how to screen the best. Wattage- What about the power? Air fryer typically needs between 800 and 2,100 watts of power. However, the more the wattage, the more powerful the appliance will be. But, before picking a high-watt fryer, make sure your power outlets of kitchen support this kind of wattage. 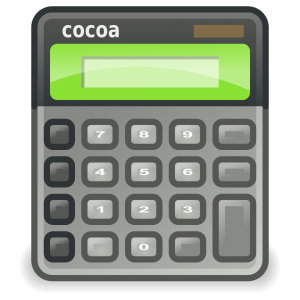 Capacity – What size do you need? Capacity is another not-to-miss pre-purchase consideration for an air fryer. Most fryers can hold food of around 1.5-2.5 pounds at a time. It may suffice for most households, but you can choose the fryer with higher capacity according to your personal circumstances. Larger companies like Philips can offer you the best on the market. A recognizable brand name will keep you assured that you are not going to be cheated. Timer allows you to set the cooking time for the food you need to cook. Some Air fryers come with manual dials while some have digital timers instead. Well, in this case, the decision is yours. If you are okay with the manual dialer, you should go for it. With the digital timer, you can have a glance at how much time is left on the clock. You need to prepare different types of food that require distinct temperature. Hence it is crucial to consider the temperature control feature of an air fryer before saying yes to it. Make sure that it is able to get to high temperature enough to satiate your food frying needs. Resembling a mini convection oven, this stylish Philips air fryer makes you a roasting, grilling and baking pro. Not bad, eh? The fryer has gained hype for its ease of use so even beginners can get going. The rapid air technology behind this gadget spread hot air with high pressure, and you know what it really works well. It is fully manual and has two different dials one for timer and the other one for temperature. You can fry up to 1.75 pounds of food that are equal to a full bag of French fries. Having a temperature dial that can be set from 90ºF to 390ºF, the fryer allows you to control the heat during the cooking cycle. You can set the timer for 1 to 30 minutes. Having dimensions between 14 and 15 inches, the air fryer weighs nearly 19 pounds with 28 oz basket capacity. No, it’s not just a bigger version of the original Phillips air fryer. Yeah, it has 50% more capacity, but its rapid air technology is what makes it stand out. Don’t worry it is not going to collapse your counter, but with this, you can cook for a crowd. 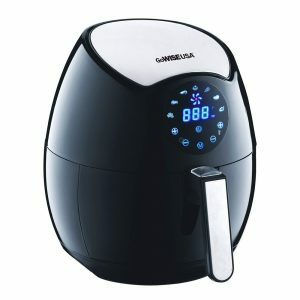 Fast frying with 80% less fat is the specialty of this gadget. This is a fully digital appliance with the fantastic pre-set feature. The touchscreen helps you cook 2.65 pounds of food at a time just with a tap of your finger. The 60-minute timer allows the temperature to adjust up to 390ºF. You can even preset the instructions for your favorite fried foods. Having a dimension of 31.5 x 42.3 x 30.2 cm inches, the fryer is easy to clean and evoke less smell than other fryers. Need a great air fryer, but don’t have a lot of cash to spend? 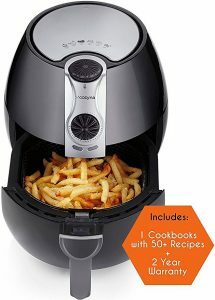 Go for GOWise air fryer. 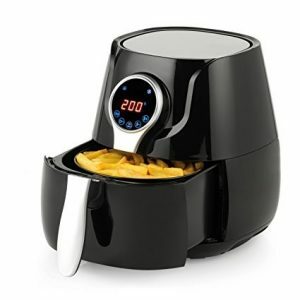 This striking air fryer is an excellent addition to any small modern kitchen. Its pre-set programs and LCD touch screen make the frying a breeze. Around 3.7 quarts of food can be fit on this frying pro and you can cook food between 175°F and 400°F. Fish, chicken, and French fries, no matter what are you craving for, this tiny device going to fry it for you. The compact air fryer is going to wow you with its sleek design and ultimate functioning. Once done with frying, dump the removable pot and basket into the dishwasher. This is such a big help in cleaning. It measures 8.5 x 9 x 12 inches and weighs a mere 12 pounds. The basket may not slide properly. The precise temperature and time settings of this excellent Coznya air-fryer can make anyone fall for it. No more checking and worrying whether the food is ready or overcooked. Every time you use this frying gadget, you are going to get the same results due to its digital control. Once done with your cooking, simply wash the cooking container in your dishwasher. Satisfying and easier cooking experience makes it one of the most desired air fryers for any beginner. The Salter air fryer is the versatile alternative to deep frying. You can enjoy chips, wedges, or fried meat and quiche without worrying about putting on weight. This little frying pro uses 1400 W power and can heat up to 200° to cook with no or less oil. Moreover, you don’t need to compromise on the taste as it will fry up your food incredibly quickly without losing any flavor. Its 30-minute timer designed with automatic switch-off, digital touch-sensitive controls and an LCD make it effortless to use. It comes with an easy to clean, removable 4.5-liter non-stick cooking basket that allows you to quickly serve the food after cooking. I hope my best air fryer review has helped you come to a decision. Now you know what the best air fryers are. So why think twice? Make your mind and start with any of the above that falls under your budget range. Do you know if philips will ever release an even bigger one? How do I clean the baked on food from the basket?